Every year close to 650 fatalities occur from automobile accidents in New Jersey. The main cause is excessive speed. Enforcement, safety engineering and education programs help to reduce this number, but it is not enough. NJFIT encourages street designs that help enforce slower speeds and accommodate all age groups and types of travel. As a result, fewer collisions, injuries and fatalities occur. NJFIT also promotes a connected streets network that provides multiple routes for emergency services. 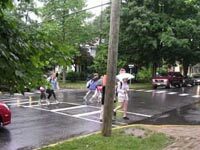 Crosswalks improve pedestrian safety and promote healthy lifestyles. Studies have shown that the frequency and severity of automobile accidents can be reduced when vehicles are driven more slowly. NJFIT supports traffic calming measures that include speed bumps/tables, center islands, narrow streets, raised crosswalks, curb extensions, roundabouts, rumble strips and pavement striping. Studies have shown that for every 1 percent reduction in motor vehicle travel, there is an estimated 1.4 to 1.8 percent reduction in accidents and casualties. NJFIT encourages mixed use, compact developments located on main streets that promote walking and biking as an alternative to driving. The Safe Corridors Program, Senior Safety Initiative, Safe Routes to School Program, Safe Streets to Transit and other bicycle, pedestrian and safety programs create safer traveling conditions in New Jersey. There is a significant reduction in traffic congestion associated with traffic incidents as safer roads create more efficient travel. For 2005 - 2007, an average of 661 people lost their lives annually in motor vehicle related crashes in New Jersey. Safe Streets FITness goal is listed below in the drop down boxes. Achieving this goal is possible through the application of various tools and programs.